An Ontario man is cloning his much-loved dog, Woofie, because he says the dog saved his life. A Greater Toronto man is cloning his much-loved dog, Woofie, because he says the dog saved his life. Woofie, a Dingo-German Shepherd cross, 20 years old, has trouble walking and has her own wheelchair. But in her earlier days, she worked in search and rescue, travelled the world, and had a role in a 2015 film, Doggy Daycare. All her life, she has been "very nurturing," says her owner Matthew Johnson. Johnson, a former film director who lives in the Newmarket, Ont., area, says the dog helped him get through a tough time in his life. Her clone, which a vet says will be a genetic twin, should be ready in six to 12 months. The cost is $50,000 US. The cloning is being done through a U.S. laboratory, ViaGen Pets. 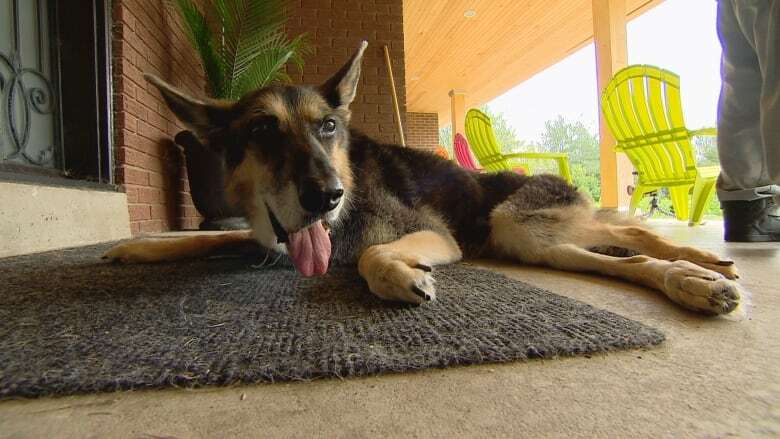 "I just figured, I have never met a dog like her," Johnson told CBC News. "She's solely responsible for making me walk." Five years ago, Johnson contracted a rare form of bacterial meningitis. "Basically this whole left side got paralyzed. My face got paralyzed. I lost vision in this eye. I am deaf in that ear. My heart stopped twice," he said. Johnson urged his brother to bring Woofie to the hospital when doctors did not expect him to live and he was in palliative care. The dog came to his bedside, slept on his bed, and he said she motivated him to walk again. "Mostly, her being there was peaceful," he said. "She brought life into that environment." Johnson said he decided when he was in hospital to clone Woofie. "After the dog left, I thought, I'll be screwed without this dog, so I think I'm going to clone her." If the cloning process results in more than one puppy, he said he will keep them or donate them to the police. The story of how Woofie and Johnson came to be pet and owner began in New Zealand, when Johnson found her abandoned by the side of the road in a garbage bag. "I came across this bag, and the bag was moving. I thought they were rabbits. There were three dogs, the two others were pretty dead. She had lettuce in her throat and I pulled all that out," he said. He took her to a local vet. "The vet said, 'It's one of them dingos again.' I said, 'Just write it's a German Shepherd. We're keeping the dog.' And he did that." 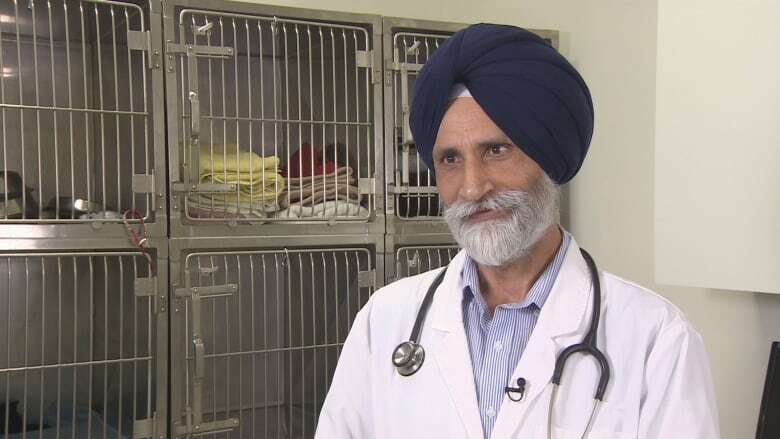 Dr. Surjit Jogar, Woofie's veterinarian at Elgin Mills Animal Hospital in Richmond Hill, Ont., said the cloning process is a complex procedure. He helped to harvest the dog's DNA by taking samples of saliva, blood and skin and sent the samples through FedEx to ViaGen Pets. He said the risk to Woofie was the anesthetic she was put under when the samples were taken. Jogar had to clear the sending of samples through the mail with the Canadian Food Inspection Agency, the College of Veterinarians of Ontario and the U.S. Department of Agriculture. In cloning, cells are taken from biopsy samples and transferred to an egg. The embryo from the clone is transferred to a surrogate mother. Jogar said cloning is not for everybody who has pets. "It's only for some people who are so much attached, who have something special with them. And they can afford it. It's their decision." The clone is already an embryo. It will be transferred to a surrogate mother, who will give birth to Woofie's genetic twin or a litter. "They will be just like normal puppies," Jogar said. ViaGen said in an emailed statement that cloning begins with a small biopsy from the donor animal. ViaGen said it produces a cell line from the biopsy and each cell in the cell line contains all of the DNA necessary to produce an identical twin. It said cloned animals can have a similar personality to the original animal. "Genetics play an important role in personality development and it interacts with the environment to produce the individual. It has been striking how similar they are as one might expect from identical twins," it said. Why is China cloning pigs on an "industrial scale"?